I have reviewed lots of microphones for use with speech recognition software for Macworld: wired headsets, wireless headsets, a handheld microphone, and even a microphone that sits on your desk. If you dictate a lot, you need two things from a microphone: good accuracy and comfort. Many people prefer wireless headsets because they allow you to move around more. A microphone that sits on your desk can be more comfortable, since you don’t need to wear anything on your head. But wired microphones can be more accurate, and you never have to worry about charging their batteries. SpeechWare’s FlexyMike Dual Ear Cardioid is a very light wired microphone that offers the best accuracy of any microphone I have tested. It weighs about 25 grams, and has a unidirectional cardioid microphone to ensure the best quality sound for speech recognition. This is a behind-the-neck microphone: two curved parts go over your ears, and a metal band goes behind your head. Mac users will need to buy a USB adapter to use the FlexyMike. SpeechWare's SpeechMatic USB Adapter seems pricey at $149, but it helps with the FlexyMike's accuracy. The FlexyMike’s cable is fairly short: it’s just one meter long, and since it is connected to the back of the microphone—behind your head—there’s only about 2.5 feet available from the front of your head to connect it to a computer. For this reason, SpeechWare includes a two-meter extension cord, allowing you to plug it into your computer wherever it is located. The short cord is long enough to use if you’re dictating with a MacBook Pro, but it’s not quite long enough to plug into the back of an iMac or an Apple Thunderbolt Display on your desk, and still give you room to move around or lean back in a chair. You can use a USB extension cable as well; in my case, I’ve found that more practical, since I do use the mute button on the USB adapter. I have no quibbles about this microphone regarding its accuracy with speech recognition, but I do have some issues of comfort. It’s very light; once you put it into position, you are unlikely to notice it. However, I wear glasses, and the over-ear parts of the microphone have to sit outside my glasses. Depending on how thick your glasses are, this could be a problem. In addition, the back part of the microphone (the part behind your head) isn’t adjustable. This means that I cannot lean back in my desk chair when I’m dictating, because the head rest will press on the headset. However, the behind-the-neck position of the microphone means that you can wear headphones while dictating. You may want to use headphones to listen to what you say in some cases, but, me, I want to listen to music, and with this microphone I can. 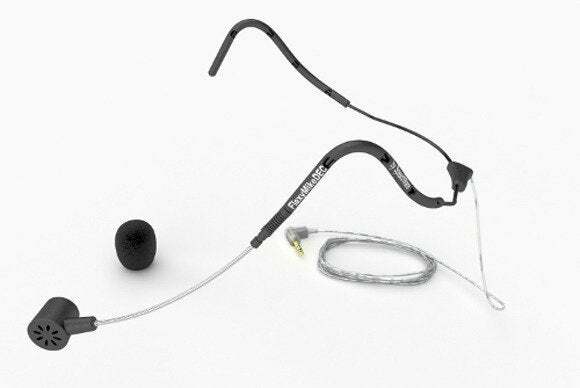 The boom of the FlexyMike is flexible, as its name suggests, but the rest of the headset is rigid. This means you cannot adjust it to suit your head, and it takes up a fair amount of space if you want to carry it with you. The company provides a sturdy box that you can use to protect the microphone, but it’s quite bulky: 15 by 20 by 6 centimeters. For me, this microphone is excellent for desktop use, but it’s less practical to take with you if you want to dictate when you’re traveling to business meetings, conferences, etc. SpeechWare told me that they are working on a wireless adapter that you can clip onto a shirt or jacket; this would make the FlexyMike a lot better, because once you’ve gotten used to a wireless headset, it’s hard to go back to one with wires. The company also makes an even lighter single-ear version of the FlexyMike that weighs about 5 grams but it doesn’t have a cardioid microphone. Accuracy is excellent in my quiet home office, but in a noisier environment, it would come in behind the dual-ear model. However, it’s slimmer than the FlexyMike, and it fits over one ear, resolving the comfort issues I mentioned above. It retails for $139, or $50 less than the dual-ear version. In spite of my reservations regarding comfort, this is the finest headset that I have tested. Accuracy approaches 100 percent, and this was in testing with a new profile in Dragon Dictate having only done the minimal required speech training. Over time, it’s likely that this microphone’s accuracy will be near perfect. 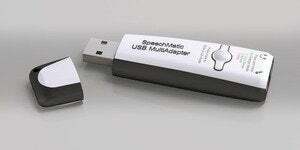 All this comes at a price, of course: the FlexyMike together with the SpeechWare USB MultiAdapter retails for $289. But this is a small price to pay for such accurate speech recognition if you are serious user of Dragon Dictate.